Minneapolis 2040 is back! In just a few weeks a second draft of the proposed comprehensive plan will be released by the city. This is a big important document guiding future decisions on street design, housing, land use, and job access. 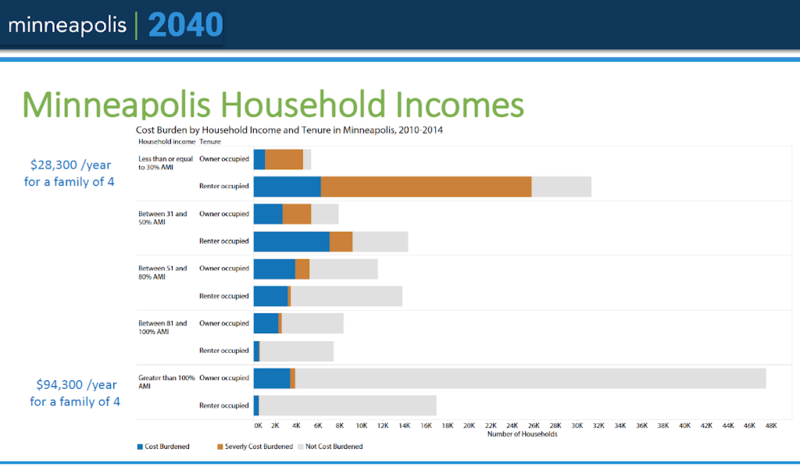 In an article originally headlined, “Minneapolis 2040 scares the rich. Is that such a bad thing?,” City Pages relays concerns from two Minneapolis City Council Members. That’s sad, but tragedy plays out on a sliding scale. Try telling one of Ellison’s [Ward 5] constituents how hard it is to own something worth so much you can’t resist the urge to sell it. Any plan for how we create a city that’s affordable to everyone shouldn’t be focused on the needs of wealthy people (yes, if you own a $900,000 house free and clear, you are a wealthy person). It should be focused the huge chunk of Minneapolis renters, predominantly people of color, legitimately struggling to afford a home. If property taxes in exclusive neighborhoods are high, Goodman created that by advocating for policies that concentrate wealth and shut out new neighbors. Exclusionary zoning drives the shortage which promotes skyrocketing property values and higher taxes in these neighborhoods. This result was achieved on purpose. Linea Palmisano, who represents swanky Ward 13, says her constituents have been subjected to unfair criticism, including from city staff. She suggests there have been accusations of racism, and says that’s “a great way to end a conversation.” Others might suggest many of her constituents would rather not have a conversation about systemic racism and exclusionary zoning. The plan isn’t nearly as revolutionary or scary as McDonald makes it sound. A city planner put it in common-sense terms: “Put the stuff closer together so it’s easier to get to the stuff.” You’re more likely to drive if your destination is further away and harder to get to. In other words, we should make it legal for more people and businesses to exist in more places while expanding options for getting there. Let’s make it easier to not drive. Minneapolis was built to serve cars. You might say we’ve spent the last 50-plus years using a blueprint called Minneapolis 1970. It’s very easy (and will remain very easy) to drive your car in Minneapolis. You can’t always say the same about walking, biking and transit. Plans for the future should be focused on making those alternatives more viable, if we care about having options for sustainable, safe, and affordable transportation. Change is hard, especially when you’ve spent generations doing exactly the wrong thing. The truth is, we will probably end up with a Minneapolis 2040 plan that doesn’t go nearly far enough. Transit, bike, and pedestrian advocates will still have to fight too hard for small victories. Driving will remain easy and the vast majority of people will continue to do lots of it. We will continue to take concerns about neighborhood character far too seriously when deciding what kind of person can live in which kinds of homes in which parts of town. In comparison to the hole we’ve dug for ourselves, these are only the smallest of first steps towards making Minneapolis a more affordable, sustainable, and livable city. If we’re going to take those steps, we need more people willing to say yes.